In this part of Noel Kempf park are Arcoiris and Ahlfeld Waterfalls...The access to these attractions is usually by air and then by motorboats...Only on raining season.. Some years ego a Lodge called Flor De Oro used to be opened. Nowadays it is not. Nevertheless standard tours or trips to this park are conducted. But these have to be planned with some time ahead..And of course all these destinations are off the beaten track of travellers. The landscape on the north side of this park is different to the south side. On the tours the time is more spent on the Itenez River and Pauserna River and as well as in the oxbow lakes of these rivers.
. What To Bring ......? 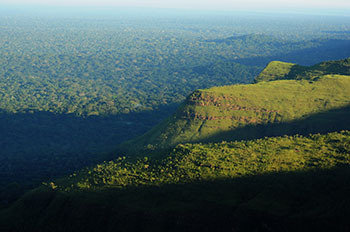 The tours or trips to visit main attractions in Noel Kempf National Park are divided in two zones..North and South. Some more time on the way and will start watching the awesome Caparu plateau. On our way to Flor De Oro and flying on the plateau we appreciate from the plane the impressing waved landscape and the different vegetations of this flat mountain while we get close to the waterfalls “Arcoiris” y “Ahlfeld”. 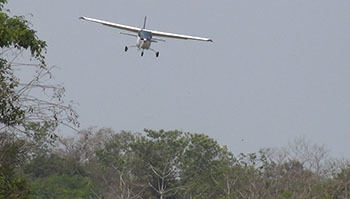 Soon we will be landing in Flor De Oro airfield. After a short walk around we set out to Ahlfeld Camp. 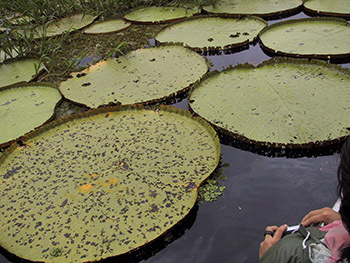 We begin a beautiful trip navigating the Itenez river waters for the first two hours approximately, sometimes depending on season is possible to find the awesome floating plant Victoria Regia. Later we need to go on Pauserna River. Pauserna is a smaller river coming out of the park. This will certainly turn our journey into an unforgettable experience. An experience which permits us to enjoy the infinite wonders of nature. 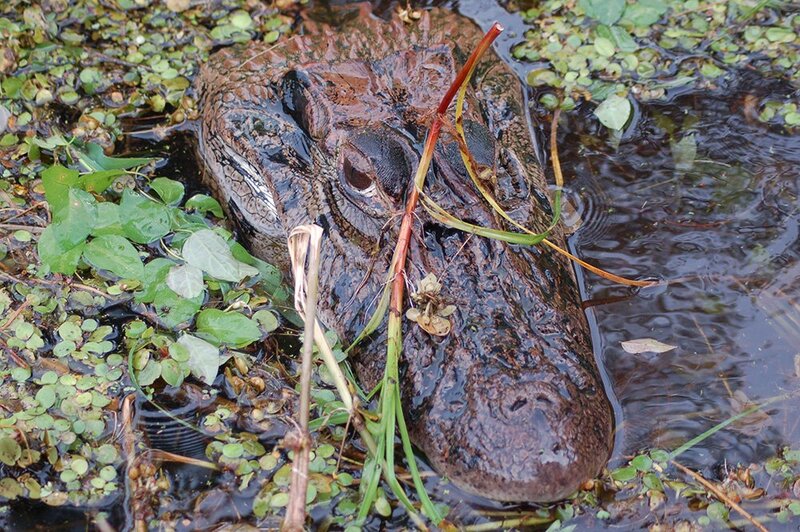 At night it possible to have a short walk to try to see more wildlife. Here is where the waterfall begins. The view from here is more impressive. Even though the view is not as extensive as the one from batton it is some how creepy. CAUTION: do not get too close to the edges since the rocks are very SLIPPERY. This first part of the walk is 40 minutes, and we will stop to enjoy the place and surroundings for about 30 minutes. 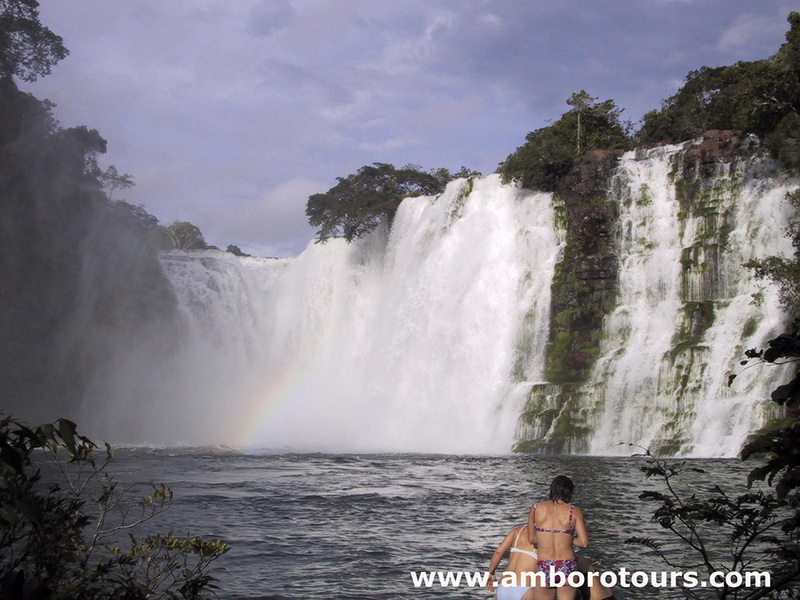 After this point, we will keep on our way up to have a close look at Arcoiris Waterfall. We keep getting further away from the camp-site on a path through different types of forests. The path will go slightly uphill towards the Arcoiris fall view point. There are parts where the path turns narrow with a rocky wall on one side and an edge that falls several meters down to the Pauserna River... We must walk very carefully. 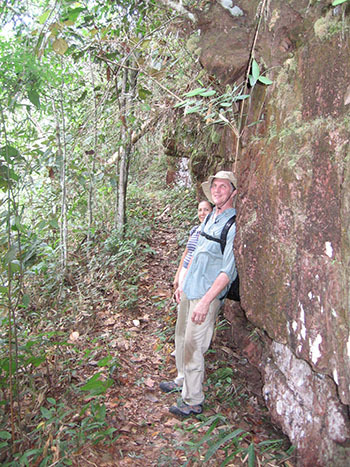 We will keep going upward on the path through the jungle whose vegetation keeps changing. 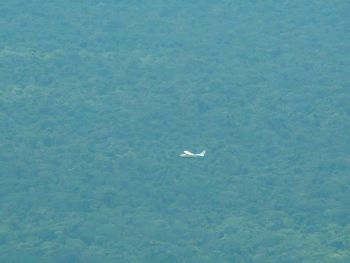 At the top we reach the Caparú Plateau where the forest’s vegetation becomes low. We walk for approximately 30 more minutes on the plateau until we get to the point where we get a magnificent view of Arcoiris Falls. It is here where we stop for refreshments and lunch sandwiches. Meanwhile we watch in this immense place, the action of the water that falling down creates a notable evaporation of liquids, part of the natural cycle which must be watched, appreciated and meditated upon. Depending on the rain season,some streams become rivers which turn into others impressive waterfalls; smaller but yet closer and more accessible to the visitor who may swim and get massaged by the fall of its water. Sometimes Arcoiris Fall may be visited from below. Though. this is not very frequent. 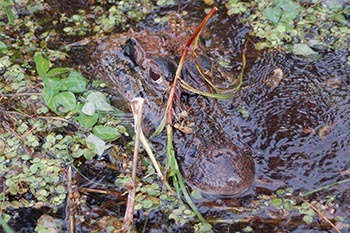 The visits to the bottom of Arcoiris depends largely on the CONDITIONS of the Pauserna River and availability of time. After we are done appreciating the watefall and its surroundings. We should return to the Ahlfeld Camp-site to rest and have dinner. After breakfast we cross Pauserna river to start a short walk through a path parallel to the Pauserna River. The path is covered by a very relaxing canopy forest. 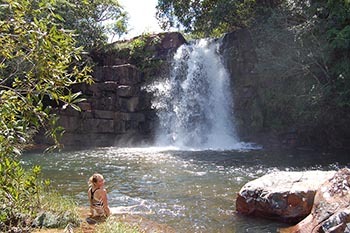 This walk is approximately 30 minutes and goes towards a natural pool formed by the Ahlfeld Falls. 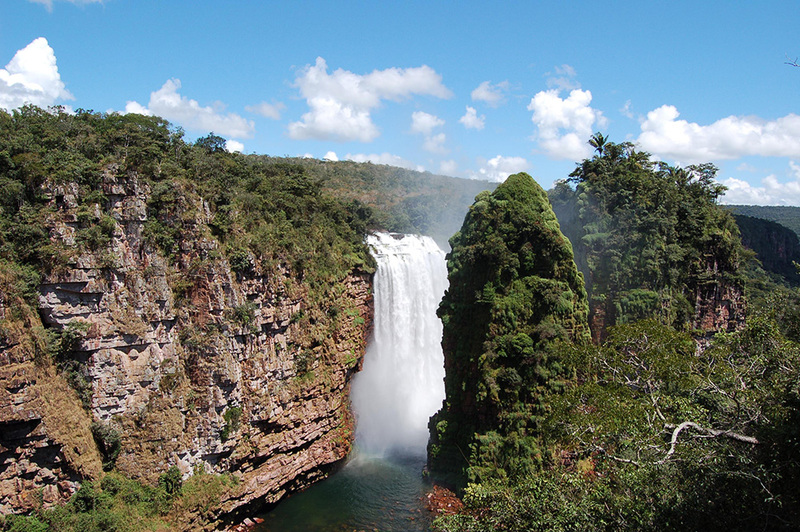 Here we will have a special and spectacular view from the botton of these famous waterfalls. We will also be able to take pictures from different angles. We will be able to enjoy these falls and take a swim but NOT to close to the falls. We must take notice and respect all existing signs and indications of caution. 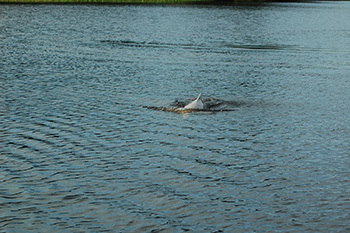 We must be aware of the presence of Sting Rays in the water as well as the presence of other animals which are not very probable but surely possible. Some times also is possible to enjoy another small waterfall from which you can get some wonderful massages for the whole body. Something exhilarating before beginning the return to Flor de Oro. The return trip is somewhat shorter than the original trip. Before breakfast, to be more in tune with the wildlife’s movements and have more possibilities of observing some mammals or birds that we have not yet seen. We would have an early walk on one of the trails. 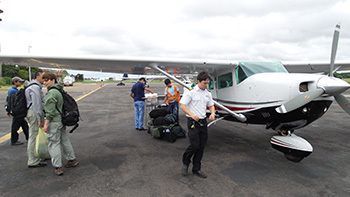 This trekking will go through some paths near the runway or paths bordering the Itenez River. Return to Flor de Oro for breakfast and we get ready to return to Santa Cruz. 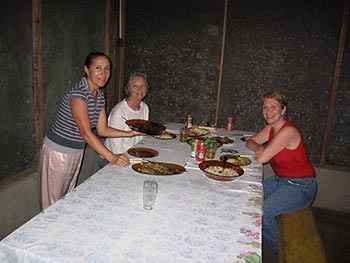 Lunch and short rest, return to Santa Cruz where someone from the company will met you to be taken to your hotel or home. 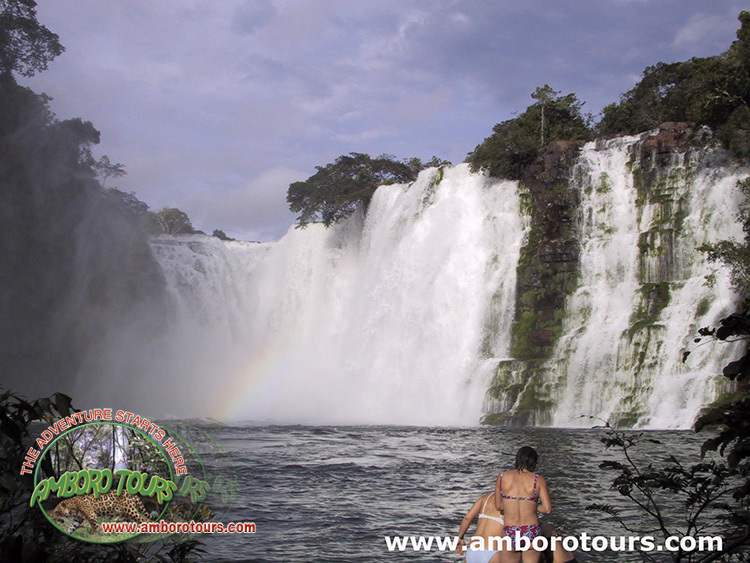 Amboró Tours also offers longer or shorter tours to this destination. Remember that this itinerary can vary or not be fulfilled in its entirety by climate factors and/or the conditions of the ways and rivers or water streams. Likewise, remember that this tour can become an adventure where mishaps can happen, which is why it is necessary to have an exploring and adventurous spirit. At 8:00 a.m. you will be picked up from your hotel or home by our personnel to be taken to the air field or airport. 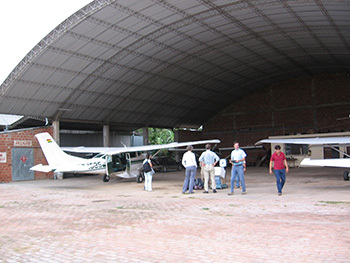 There we will board a small single-engine airplane which will take us to Noel Kempff National Park -Northern side. Flying for some more time we start seeing how the exuberant green carpet get thicker, to soon enter the on the virgin jungle of park. After a short rest we will take a approximately 1 ½ hour walk on one of the camp’s paths. 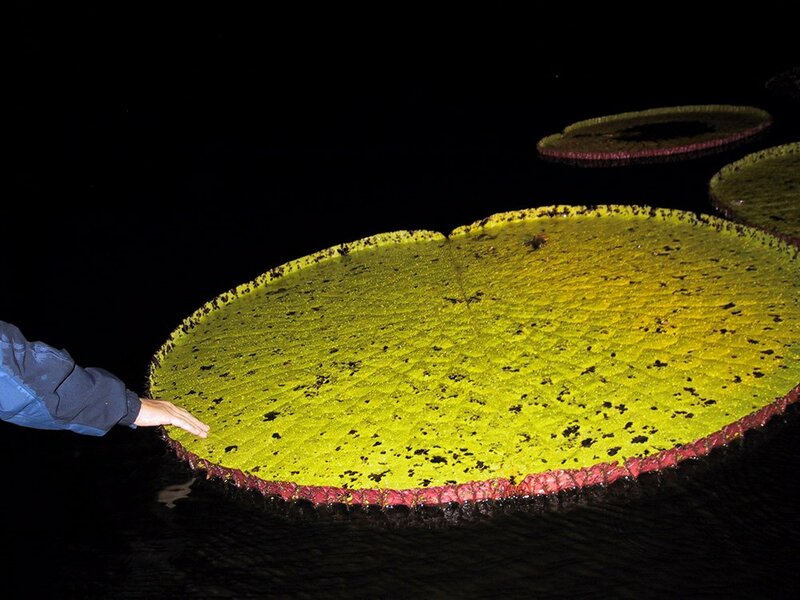 During the day and at night we will have the opportunity of taking a night excursion on motor boat with a spotlight for about an hour in the Itenez River and some of its oxbow lakes . 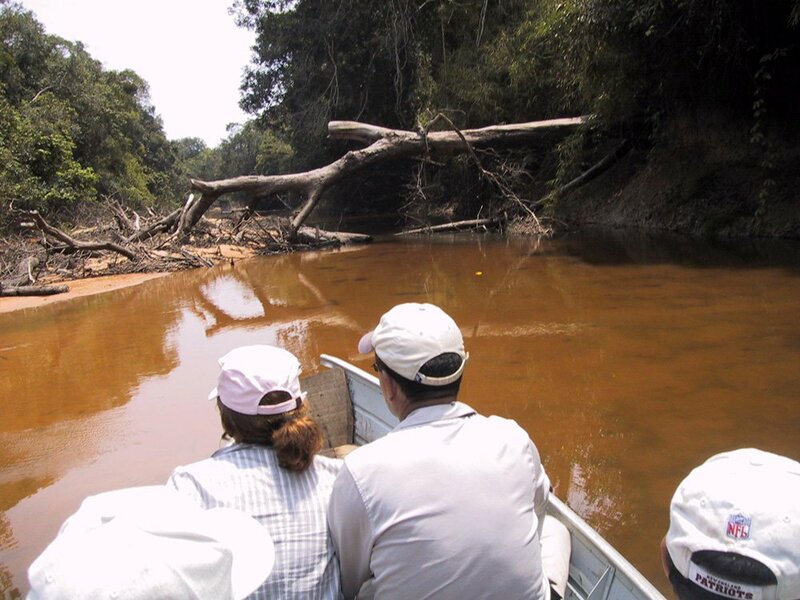 During this boat ride we will have the opportunity to see up close different kinds of fauna like giant river otters, dolphins, and birds in the river banks. 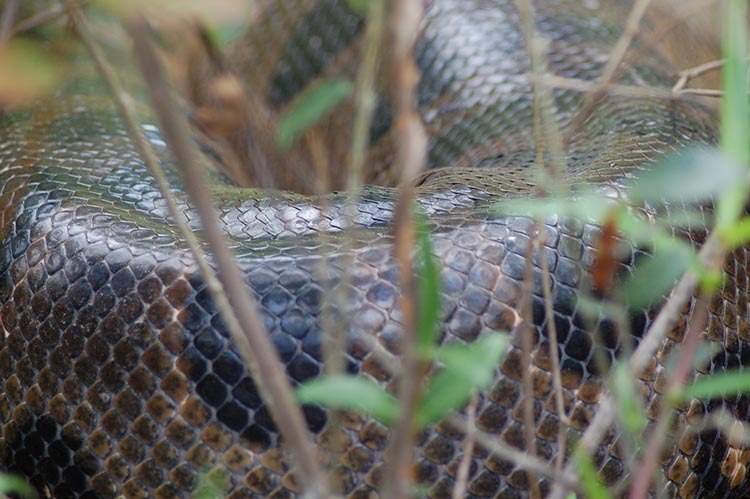 During this ride we will also have the opportunity to see caimans and nocturnal snakes on tree branches. 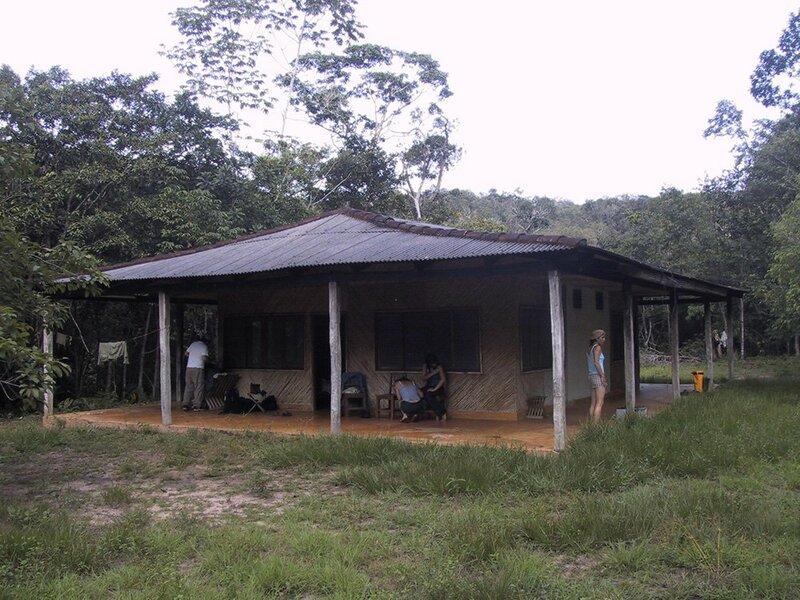 After breakfast we leave Flor de Oro and set out to Ahlfeld Camp. We begin a beautiful day navigating the Itenez River waters. For the first two hours approximately, then on the Pauserna River. Arrival to Ahlfeld camp. Settle in cabins or in campinng. This will be our sub base camp for all our excursions. After lunch we cross the Pauserna river to start a walk through a path parallel to the River. The path is covered by a very relaxing canopy forest. 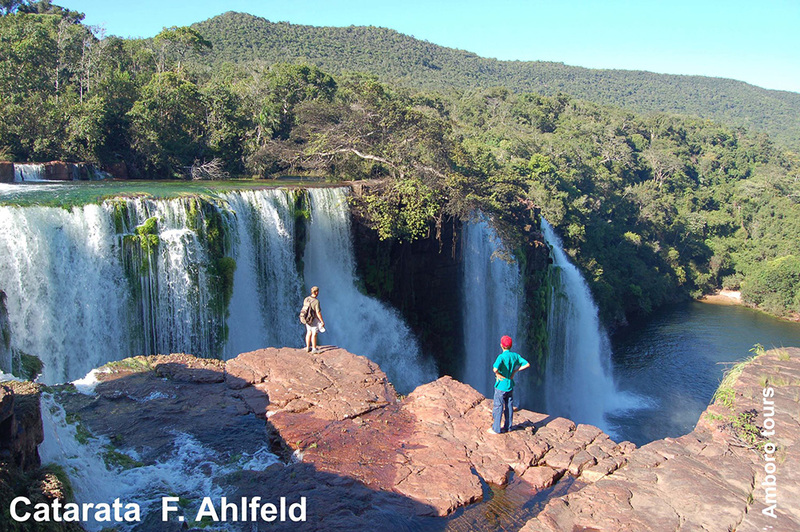 This walk is approximately 30 minutes and goes towards a natural pool formed by the Ahlfeld Falls. 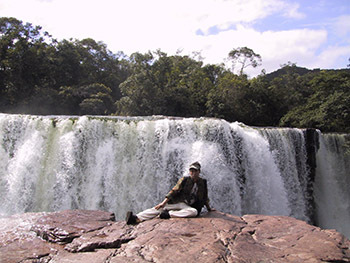 Here we will have a special and spectacular view of this famous waterfalls. 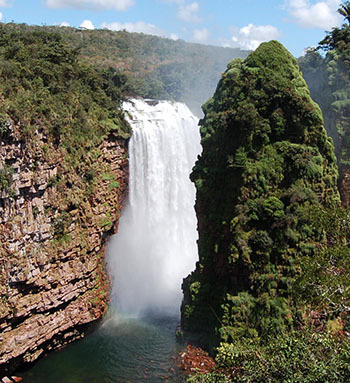 From the botton we are have have a spectacular view of the waterfall from different angles. We will be able to enjoy this place and take a swim but NOT to close to the falls. We must take notice and pay attention to all existing signs and indications of caution. We must be aware of the presence of Sting Rays. After this, we return to Ahfled camp for dinner and rest to be ready for the next day. Tonight a ahort nocturnal walk is possible if the guests desire to do so. Over night in Ahlfeld Camp. After breakfast, we will set out on a path parallel to the Pauserna River towards the top part of the Ahlfeld Fall. There are parts where the path turns narrow with a rocky wall on one side and an edge that falls several meters down to the Pauserna River... We must walk very carefully. 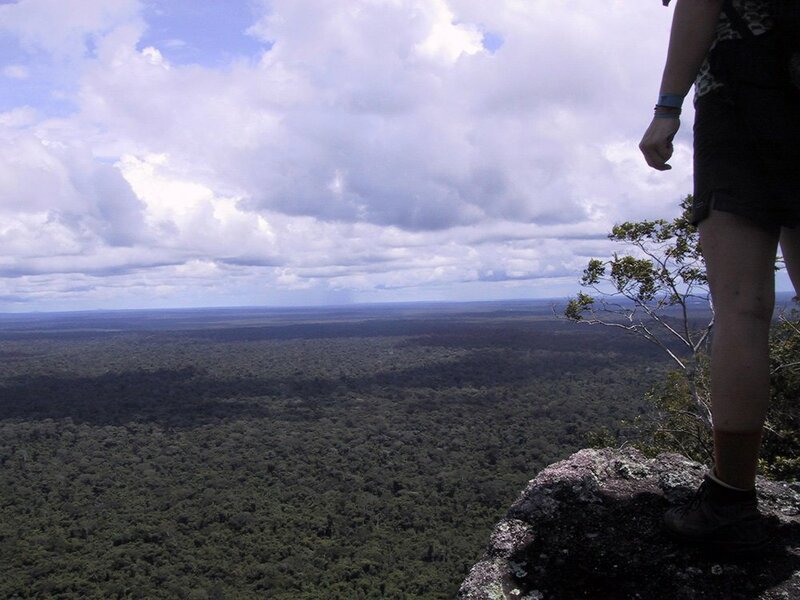 We will keep going upward on the path through the jungle whose vegetation keeps changing until at the top we reach the Caparú Plateau where the forest’s vegetation becomes low. We walk for approximately 30 more minutes on the plateau until we get to the point where we get a magnificent view of Arcoiris Falls. It is here where we stop for refreshments and lunch sandwiches, meanwhile we watch the immense place. The action of the water falling down creates a notable evaporation of liquids, part of the natural cycle which must be watched, appreciated and meditated upon. 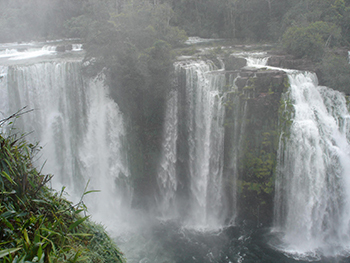 Depending on the rain season, some streams become rivers which turn into other impressive waterfalls; smaller but yet closer and accessible to the visitor who may swim and get massaged by the fall of the water. Total trekking time (one way) from the Ahlfeld camp-site to the Arco iris Falls observation point is approximately 3 hours. After we are done appreciating the waterfall and its surroundings. We should return to the Ahlfeld Camp-site to rest and have dinner. Breakfast and if the guests prefer we can cross the Pauserna River on boat to enjoy a smaller falls and from which you can get some wonderful massages for the whole body. Something exhilarating before beginning the return to Flor de Oro. The return trip to Flor de Oro is somewhat shorter than the original trip. 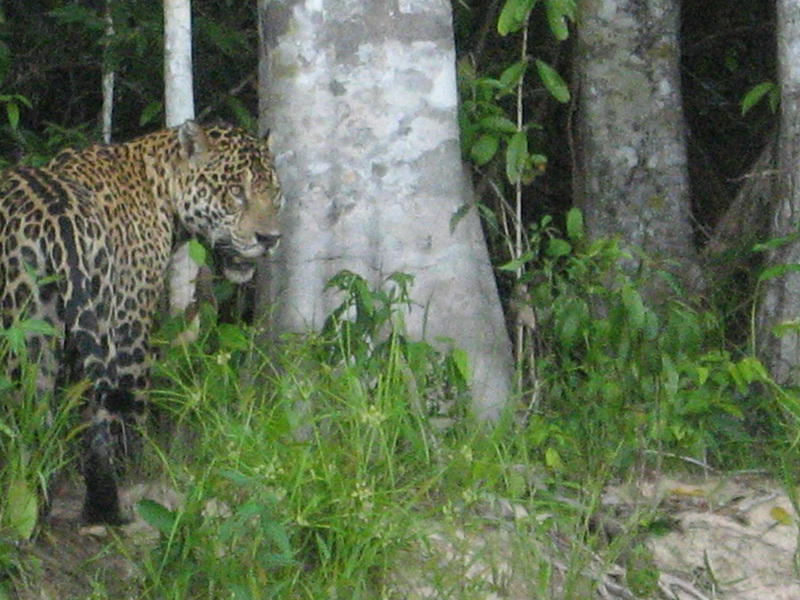 Before breakfast, to be more in tune with the wildlife’s movements and have more possibilities of observing some mammals or birds that we have not yet seen. 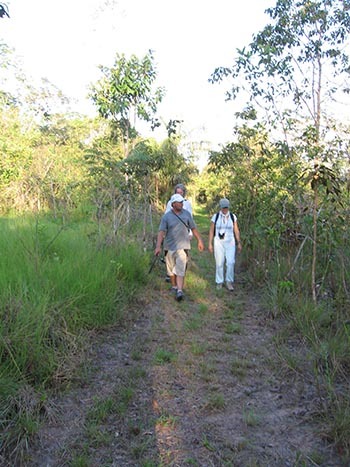 We would have an early walk on one of the trails close to Flor de Oro. This walk will last approximately 1 ½ hours and will go through some paths near the runway. 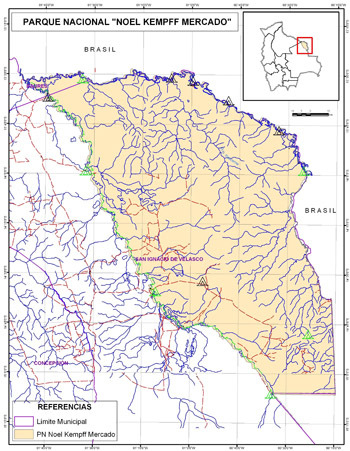 Or if the conditions allow it, We could have an early boat ride to visit he first oxbow lakes close to Flor de Oro. Or we could have a combination of both, a boat ride and a short walk. The landscape on the north side of this park is different to the south side. 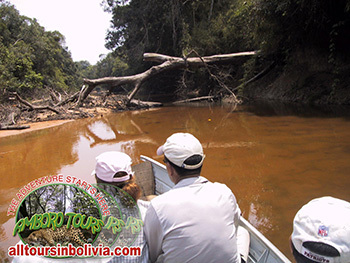 On the tours the time is more spent on the Itenez River and Pauserna River and as well as in the bays of these rivers. Arcoiris and Ahlfeld waterfalls. 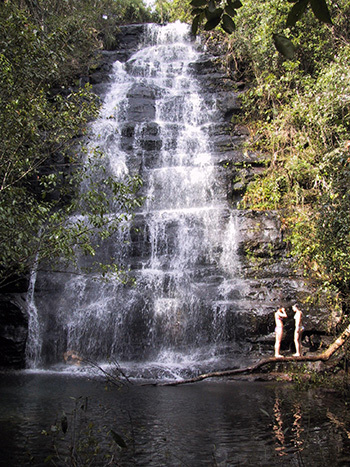 Although you can find others waterfalls that appear near or on trails towards the main ones. 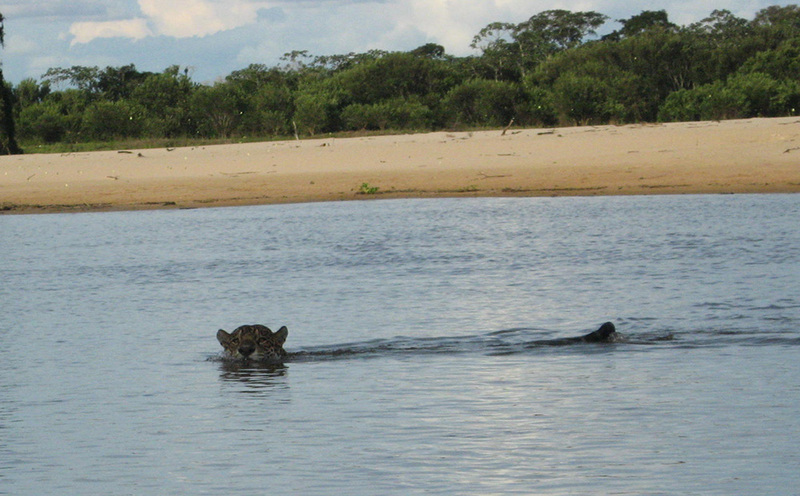 Other major attractions are the chances of observing the freshwater dolphins and Giant River Otters among many other mammals Giants of the Amazon. The number of birds that can be appreciated, according to the experiences and knowledge, are more on this North Side more, but the species are much more varied in the south side of the park. 4. Protect things you want to keep dry by putting them in plastic bags. 8. Do not smoke or light Candles inside the tents. Strongly recommend the use of long sleeved shirts and pants. During both day and night, and the use of repellents. 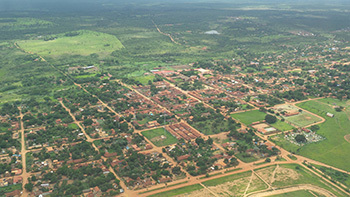 keep in mind that you are travelling in sparsely populated areas where few people go. - You have to carry your camping gear and water. And you may have to help the guide With 1 or 3 kilos. Unless you have paid for a porter. - Likewise, remember that this tour can become an adventure where mishaps can happen, which is why it is necessary to have an exploring and adventurous spirit.